For the video review of Life of Pi and Rise of the Guardians, click here. I was fairly won over by this movie’s premise when I first looked at the trailer. Going into this, I was expecting a dark and gritty survival flick where two mortal enemies have to work together. What I got is best described as an American foreign film with a touch of Hermann Hesse. The story follows a young man named Pi Patel, played by Suraj Sharma with Irrfan Kahn playing Pi in his adult years. When his family decides to move to Canada, the ship they are on sinks during a thunderstorm, the only remains being a single life boat carrying Pi and a few of the animals that were on the ship, most notably an adult Bengal Tiger. It has the same episodic quality most adult fiction novels take when adapted to film. As a result, the story is far denser than the trailers let on. Most of the story is framed as an interview between the adult Pi and a writer looking for a story. Part of the way through, the movie almost forgets its own framing device, replacing the narration with narration provided by the teenage main character as he keeps a journal. Although the previous framing device is recovered by the end of the movie, it was still pretty weird and confusing. 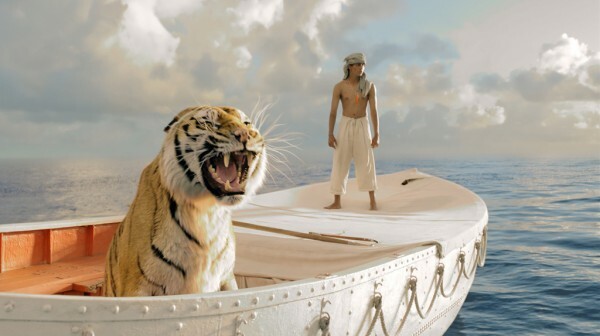 From a technical standpoint, much of the “Life of Pi”’s emphasis is on the visuals, which are incredibly expansive, as well as ranging from gritty realism to dream-like religious fantasy. For the most part, the film feels grounded in reality, but then when you get to the third act, things take a bit of a weird turn both visually and in terms of the story. The reason for this is because the 3D kills some of the green screen effects throughout the film, making the outlines around the actor stand out even more. Aside from the 3D messiness, the “Life of Pi” is put together quite well, there’s a nice balance of tension, atmosphere, gritty realism, and cerebral hallucination. The pacing of the film also makes things move a lot more quickly. Given that this movie essentially covers a lifetime, it makes it easier to watch. Overall, this is a pretty good film if you’re looking for something that’s focused on the visuals while telling a story that is left open to your own interpretations, at least as much as they were willing to risk. While there were some iffy parts of the story, it still keeps you engaged throughout the movie’s two-and-a-half hour runtime. On my personal scale, I give the “Life of Pi” a 4/5.